<< Translated into English by Lama Lotuschef. Please do your own translation to have a version that you can understand at this stage of your cultivation. A common saying circulating amongst many people : Reputation is One’s second life. I feel that this is laughable. Because basically, I do not need or like reputation, and am against reputation to the extent of destroying it or kick it down. Must know that [Reputation] is causative matter of Harm in this world. Mankind are truly harmed by this [Reputation] continuously, upsetting or messing up, resulting in great calamities. From ancient times to now, battles between 2 countries resulted from [Reputation]. Disputes over [Big Country], [Small Country], [Authentic tradition] and [Fake tradition], [Master Country], [Subject Country]. Small ones to the Individual’s love of “Face”, which is [Reputation]. Overtly love [Reputation], naturally will have to give back great return. People of the world have disputes because of [Reputation of Face] (Ego). Fixatedly stubborn. People of the world go to Court because of [Reputation of Face]. Fighting Defamation suit. Lost people don’t loss arena, humiliation cannot persevere. Thus, all [battles] arise from here. Is there benefit from [Reputation]? 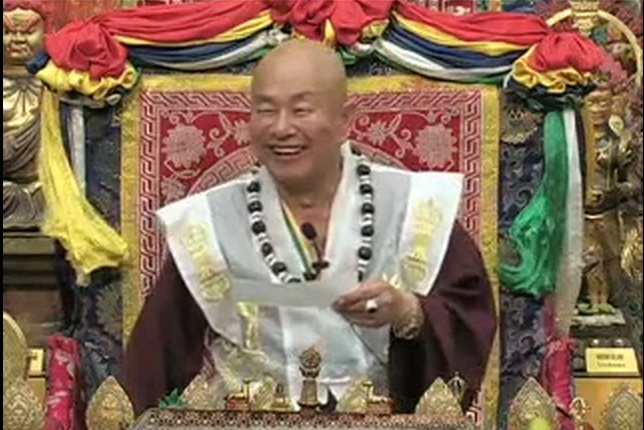 However, Living Buddha Lian Sheng does not need Reputation, thus can [Live]. I have learned how to [be humble and not to dispute/fight]. I have learned how to [abandon luxury for true necessities]. [Reputation does not interfere with me], I can stay untoppled in these back and forth, all due to the absence of [Reputation mindset]. Have generous outlook, but don’t have [Reputation]. Basically, I do not want prestige or face, or to the extend that I don’t have [face], and the topmost don’t want face in the world. People alleged me as [Evil], actually I am [pure and self righteous]. People alleged that I have [Ulterior motive], actually I [Naturally transform without motive]. People get rid of me, I go far away to foreign land, sleeping high and soundly. People sue me, I make no reply or argument, no dispute. I am against [reputation], going for humbleness; not gearing towards falsehood of fame; teaching No disputes nor fights; I adhere to nature, arrived at form or Selflessness. I build temple, let others be abbot. I expound dharma, students sit in the middle (place of importance). Charity for the world, I do not take charge of money. I don’t have [Authority/power], also no [money], don’t have anything. Because I don’t have [Reputation mindset], don’t want status, infinitely teach [no disputes no fights]. [Living Buddha], is just an empty name. It belongs to Illusionary Void. Once I enter retreat, everything can be disintegrated, originally is Illusionary Void. In Meditation, my body is Illusionary Void, lifeless, where can Reputation be attached to? I have no heart, with heaven earth and universe as heart. Heart’s light radiates, becomes an infinite light orb. I know everything has died, only my consciousness, thoughts, path, are alive. Actually, consciousness, thoughts, path, are not mine. Within [These], there is no [Reputation]. Honestly simple (down to earth) and realistic. An Egoist who has already removed reputation; extinguished pride; greedy craving for illusionary name or fame; frivolous attachment or fixation. Pure Illusionary self abide [Zen]. Humble, low, self maintaining [Void]. Most close to Path. Most close to naturally without ulterior motive. [Reputation] is a surface, not real and most unreal. [Reputation] is evil hateful Materialistic form. Heart of Universe, Buddha, Zen, is the Heaven’s most unfathomable heart, worldly people only see the surface and not the depth within! [Reputation is One’s second life], that’s dangerous! Bear the keys in this article deeply in your mind or carve them in! AND this Freeing will help you greatly in closing the gap between you and Buddhahood!